Thoughts on photography and other things by Jeremy Moore. An intimate and a distant encounter. While I sometimes feel pangs of envy (…or is it lust….?) on hearing about the presence of a rare bird, I would not admit to being a twitcher. There is something rather desperate in the idea of travelling miles (or hundreds of miles) to try to see a bird which was originally found by somebody else and put out on the birders’ grapevine. I’ve sometimes described myself as the worst twitcher in the world, anyway, because on the rare occasions I’ve succumbed to temptation, the bird has usually disappeared by the time I arrive. I can justifiably claim to have been the first person not to see the great spotted cuckoo at Tenby in February 2014 because I waited too long to go down. It had probably died or been blown away during the particularly stormy day of my journey. To fail in a pointless quest is particularly soul-destroying, I find. But if a bird is on my local patch I might eventually get round to having a quick look, sometimes successfully, sometimes not. A local bird would involve little time investment, or travel expenses or carbon emissions. I was tempted last week, though. A red-footed falcon had been reported in Staffordshire, well over a hundred miles from here. However, a visit to my aging mother was long overdue, and she lives ……. in Staffordshire. I do like multi-purpose journeys! So Saturday morning found me on the northern outskirts of the Potteries joining a few dozen other birders staring at a red-footed falcon on an overhead electricity cable. It was hardly the most difficult twitch in the world. The click of motor-driven shutters rang out. Being an immature male it would not be breeding this year; but one has to wonder why ever would this bird end up in north Staffordshire? It probably should have been somewhere in eastern Europe. 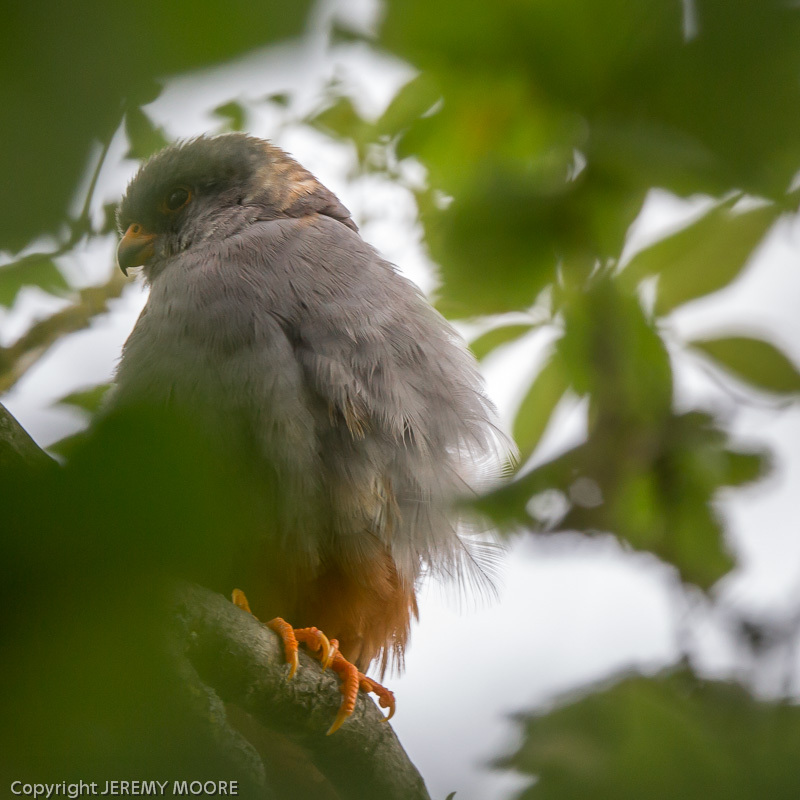 Itcould conceivably have been escape from captivity but the only known captive red-footed falcon locally was an adult male in a rescue centre about twenty miles away. Whatever – in birder’s parlance it was “performing well” – perching on the cable in full view, searching for insects on the ground below. There was a strong breeze blowing, though, and, probably seeking shelter, it later spent some time in a hazel bush just a few feet from the pavement on which expectant birders waited. It was so close that I had to take a few steps backwards before I could focus down on it with my binoculars. However a shield of branches and leaves made it difficult to see more than face or feet at any one time. It was an both intimate and distant encounter at the same time. As far as the main image is concerned the bird was by no means at its closest here. I feel that the green background sets off its plumage better than the grey sky did, however. And as for the composition, I suppose I just like to be different! Any thoughts on this? Recently described as "Wales' leading environmental photographer"; based near Aberystwyth, and specialising in Welsh landscape and wildlife. He has published the Wild Wales / Cymru Wyllt range of postcards since 1987. His most recent book was "Wales at Waters Edge" (with Jon Gower) published in May 2012. The National Library of Wales has a large number of his prints in its Collection. His exhibition "Bird/land" was shown at Aberystwyth Arts Centre from June until August 2016. It originally received support from the Arts Council of Wales. He is also working on a new book about Wales with the author Jon Gower, due for publication in autumn 2018. 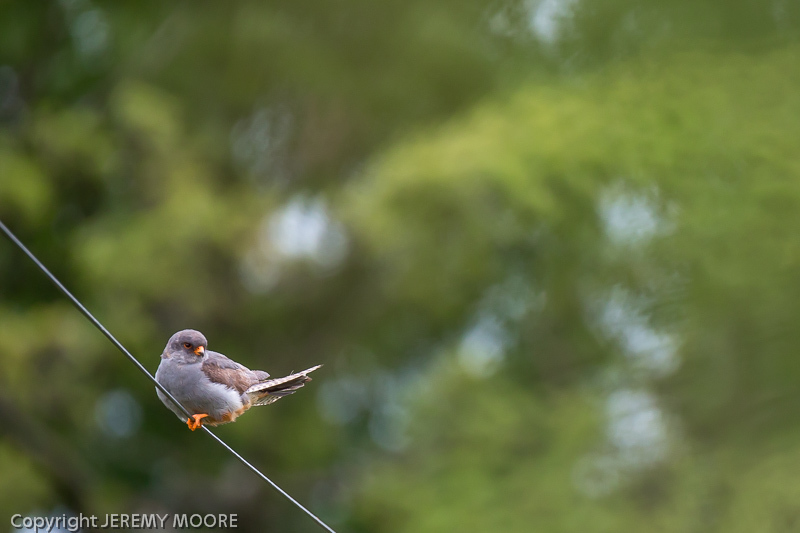 This entry was posted in Uncategorized and tagged bird photography, birding, red-footed falcon, twitching. Bookmark the permalink. 6 Responses to An intimate and a distant encounter. You are so right about the little red foot. My best ever 5 hours birdwatching took place in Hungary at the rustic tower hide on the Kiskunsagi reserve, freezing cold at 5 am and sitting on small stools for 5 hours we could observe courting and nesting red foots and kestrels just feet away through one sided glass: absolute magic! See Welsh kite Trust blogspot for June 2013 for details and some inadequate pics (by your standards!). Yes, it was a gorgeous bird, but not as pristine as the adult male which I mentioned in the post and had actually seen the previous day. It was curious that it was so approachable, just a few feet away, as you can see. There’s some suggestion that it may after all have been an escaped falconer’s bird or pet. Some photographers were apparently feeding it live crickets (not the day of my visit) and this has created a taking point on t’internet as you can imagine. Finally, apparently, some dodgy characters in a white van have been trying to catch it using a net. I’ve seen some photo’s from the hides you mention – it must be a fantastic place to go. Nice looking bird, Jerry. I wonder what our native birds think when they see it for the first time! I like the composition, maybe for such a striking bird I’d prefer a closer crop but I’m sure you already have a few of those in the bag.. Thanks for the comment. It did go for a little fly around and was chased by some swallows. It came back with a dragonfly. I do have a few closer shots – nothing brilliant – but the background is a bright grey which doesn’t really complement the bird very well. Striking photos of a striking bird – I like the blurred green background in contrast but I also like the intimacy of the other photo with it hiding in the tree. You wait for years for an eagle re-introduction project to arrive…. Kit talk. Far too much kit talk.